Happy Wednesday, intrepid readers! I hope you are having a lovely week. 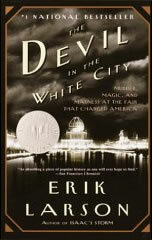 Here's David's favorite library book at the moment. 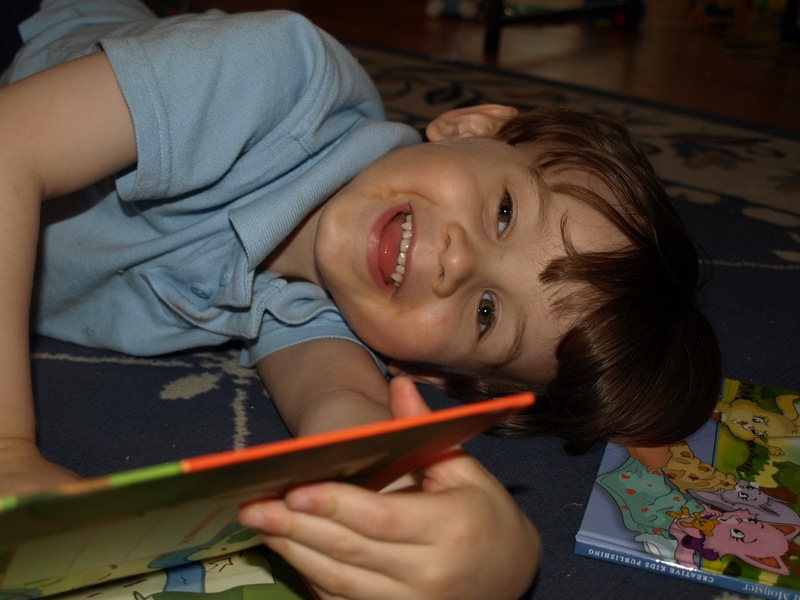 Fortunately, Unfortunately is a book made in heaven for little boys. It features everything they love - aliens, pirates and dinosaurs - all in one adventure. It probably could have done with a garbage truck or train thrown in for good measure, but I digress. When I spotted the cover of this book, I knew we had to read it. The hero of our tale is named Milo. His mother asks him to go to Granny's house (of course!) to return her umbrella which she left behind. On his way, he gets caught in a rainstorm and accidentally walks off of a cliff. And so the adventures begin! This book has a repetitive structure that kids will pick up easily. Each fortunate event is followed by an unfortunate one, hence the title. The thing I loved best was noticing the subtle details Mr. Foreman puts into his illustrations. It wasn't until the third reading that I realized that Milo's granny (yes, he gets there eventually!) is wearing roller skates under her dress and apron. Thoughts from David: "I like it because there are dinosaurs there...and pirates! I like pirates." Case in point. 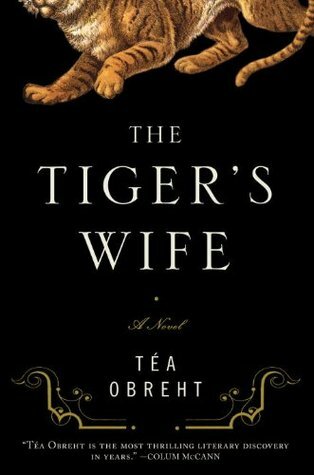 Technically, this should be a review for The Tiger's Wife. However, I am having a strangely difficult time writing the review for that book. In the meantime, here's a review for The God of Small Things, which I also finished reading recently. When Rahel hears that her twin brother Estha has returned home, she leaves America to go back to Ayemenem, India. She is desperate to reconnect with her twin, her best friend, the only one who truly understands her. Rahel’s return back to their childhood home brings back a lifetime of painful memories that she had tried to distance herself from. She cannot help but remember the summer that their lives changed forever – the summer that their cousin Sophie Mol came to visit. I had trouble getting through this book. While I think Ms. Roy can write very beautifully, this book is just too overwhelming. Each page you turn is filled with pain, inflicted by society, by circumstance, by the people who claim to love their victims. It’s very hard to take, especially as there is no change. This is not a book where one terrible event leads to a change in the lives of those it touches. Rather in this book, the terrible event in question only mires the characters deeper in the hell in which they live and never are able to escape. Perhaps because of this, I had a difficult time relating to the characters. Some of it may have been cultural, but the adult were so busy hurting each other (and the children!) that it was difficult to really feel compassion for their pain. I almost stopped reading in the moment when the twins’ mother tells them that when they are careless with their words, it makes people love them a little less. The poor children are certainly victims in their circumstances, but they are so wrapped up in being twins, that one feels as if they are living in their own world. Ms. Roy gives her readers an intense look into the complexities of being a twin and living in a culture where you are not valued. There’s no levity to offset the pain that the characters are constantly experiencing, which makes it a very difficult book to read and, perhaps, an even harder book to enjoy. Happy Monday, everyone! I am happy to report that everyone is safe and sound post-Irene, and our house was unscathed as well. We did lose power for 26 hours and camped out in the downstairs hallway in case the threatened tornado touched down.The storm also afforded me the opportunity to do some reading by candlelight on Sunday night, before we got our power back at midnight. Onto the books! David and I reviewed Watermelon Day, I reviewed The Hours by Michael Cunningham, and I wrote about how lovely Anne Lamott is and how fluffy reading is sometimes very necessary. How did Irene treat you? What are you reading this week? Let me know in the comments! The Hours by Michael Cunningham is the most beautiful book I have read in a long time. I couldn’t decide if I wanted to devour this in one sitting, or read just one chapter a day and savor the lovely writing. The words that come to mind are actually rich and delicious. I don’t love using those words because then I feel like I should write about cake, but in this case they are the right ones. This novel is about the lives of three women – the esteemed writer Virginia Woolf as she begins writing Mrs. Dalloway; Laura Brown, a California housewife in 1949; and Clarissa Vaughan, a book editor living in New York City at the end of the twentieth century. Each woman deals with questions of desire, wondering if they really want the life they live or if there could be something better if they just take the leap. Mr. Cunningham is an excellent writer. As someone who loves the writing of Virginia Woolf, Mrs. Dalloway in particular, I felt that he evoked the style of her writing without being confined by it. Clarissa is even lovingly called ‘Mrs. Dalloway’ by her best friend Richard. Of course, her first chapter opens with her setting out to buy flowers for a party. This novel is so complimentary to Woolf’s that if you haven’t read either, I would advise you to read that and then read The Hours immediately afterwards. The Hours is decidedly a book for people who love books. A love for and solace from literature is found in the narrative of all three women. Virginia clings to her writing as her savior from the demons that taunt her. Laura finds reading Mrs. Dalloway infinitely more appealing than going through the motions of her everyday life, such as caring for her husband, child, and home. She finds every moment of possible reading time, beginning first thing in the morning “as if reading were the singular and obvious first task of the day, the only viable way to negotiate the transit from sleep to obligation.” Clarissa is a book editor who searches for the one book that holds the emotional weight of a cherished memory. I am inspired to go reread Mrs. Dalloway and collect the other books of Michael Cunningham. 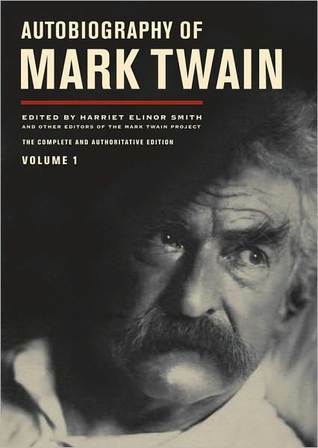 Those Pulitzer people knew what they were doing when they awarded this book. This is one of my new favorite novels and I actually took a few days off from reading after this one – I just needed to sit with this book for a few days. Friends, we're bracing for a visit from Irene here in NJ. Please stay safe and if you're far away from the storm, your prayers for those of us battening down the hatches would be greatly appreciated. See you on Monday. I feel as if I've found a fairy godmother. Like many people who love reading, I like to imagine from time to time that I could also be a writer (if that actually happens, I will be sure to let you know.) I had heard many times about a book called Bird by Bird. I grabbed it from my library and spent a week or so reading a short chapter or two each day. It always left a smile on my face. This is a book full of advice about writing, but it's so much more than that. It's a book about making art and living fully and really seeing what is happening in the world around you. Anne Lamott is extremely funny, endlessly insightful, and a beautiful writer. Her advice is honest, but so encouraging. With every word, you feel that she believes in you without ever having met you. I would love to have her sit on my shoulder like the little angel of old cartoons. She could encourage me and once in a while tell me an outrageous joke. I have added everything she's written to my TBR list. If you haven't read anything by Ms. Lamott, get to it - she will encourage your heart and make you laugh...out loud - you know, the really loud laugh that causes your husband to come in from the other room to see what is so funny. Thank goodness for Anne Lamott and her genuine, kind, beautiful writing. I wasn't really sure David was going to like this book. I had to do a little convincing to get him to sit and listen the first time. But now? He checks to make sure I haven't taken it back to the library when he wasn't paying attention. This is a lovely story of a little girl named Jesse who spots a large watermelon growing in their patch. Her pappy tells her that when it gets bigger, they will have a "watermelon day," where her cousins will come over and they will have a family party. This book is about the summer of waiting for the perfect day for the perfect watermelon. It would be a great story if you are planting some flowers or veggies with your little one. They can wait along with Jesse for the big day when their hard work pays off. “I love when all of this happens (pointing to the party with the family) and when she has a watermelon face, and when the doggy tries to get it, that’s fun too." This week I have not done as much reading as I would have liked, due to a sick little guy and you know, life. Anyway, here's what's been happening at Literary Lindsey. 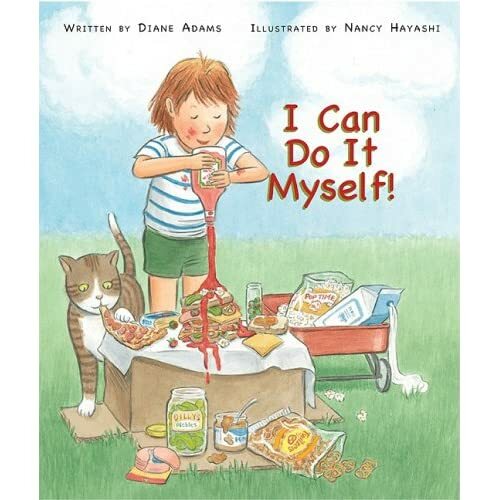 Wednesdays with David: I Can Do It Myself! Stacy Schiff is a very gifted biographer. 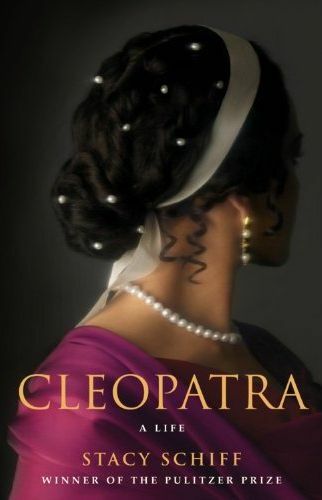 She turns everything you thought you knew about Cleopatra on its head. Cleopatra’s seductive nature, her stunning beauty, and that infamous snake may all turn out to be creations of the Romans who couldn’t uphold the image of a brilliant, powerful, female ruler. In her first chapter, Ms. Schiff writes “I have not attempted to fill in the blanks, though on occasion I have corralled the possibilities. What looks merely probable here remains merely probable – though opinions differ radically even on the probabilities. The irreconcilable remains unreconciled. Mostly I have restored context.” I appreciate this in a biography. I think that, often, biographers use conjecture as fact. While the author here will provide options, she is not afraid to conclude that we just do not know what happened or why something occurred the way that it did. One of the most interesting sections was the one concerning her death. It is part of our ingrained ‘knowledge’ that Antony and Cleopatra died together, from a snake bite. We’ve seen this depicted by Shaw, Shakespeare, and that infamous movie. However, Schiff’s research reveals that they died separately. She also indicates that Cleopatra is much too educated and resourceful to die by snakebite, which would result in painful, drawn-out suffering. Cleopatra presents the reader with a comprehensive picture of the infamous queen. She is neither hero nor villain; rather she is a woman who was a smart and able ruler. She is a woman who loved; certainly her children and her people, if not her two lovers. Schiff is able to look past modern culture’s perception of Cleopatra as Elizabeth Taylor, she of the kohled eyes and alluring gaze, who tumbles gracefully out of a carpet to seduce the much older Caesar. “Cleopatra unsettles more as sage than as seductress; it is less threatening to believe her fatally attractive than fatally intelligent,” she writes. Instead, she presents us with a real woman, with flaws and faults, who reigned over Egypt more intelligently than many of her male predecessors. Ms. Schiff has written an excellent study of a woman who rose above the societal rules of her time to become a ruler who will live in the annals of history forever. So I am trying a new thing here on the blog - this is from Book Journeys. I tell you what I'm reading, what's coming up, etc. Let's see how it goes! That's it for now, lovely readers. Happy Monday! Joan Didion’s memoir The Year of Magical Thinking has been on my radar for a while. When I happened to spot it out of the corner of my eye on a trip to the library, I grabbed it and added it to the pile. I have mixed feelings about this one. Ms. Didion is a great writer and I found myself bargaining to just read another chapter or two. That being said, I felt like I was intruding on something very personal. This book deals with the year after the sudden death of her husband, a year in which she spends a majority of her time at the bedside of her only daughter who remains in a coma. While reading this book, I felt like I was looking out my car window at an accident on the side of the road. My instinct was to look away, and yet I was intrigued. We are used to reading about moments of crisis, a time of grief, but to read an entire book about the mourning process is tough to take. Didion is surprised to find that mourning is often unemotional – there are not fits of weeping or crazy decisions. She seems rational to the people around her, but she imagines ways in which her husband could come back to her. Like any writer or lover of words, she turns to books. She studies medical textbooks and journals to discover exactly what happened when her beloved husband left her and what kept her daughter alive. She reads passages about life and death and love from books that she loves, books she has written herself, and books written by her husband, looking for the right words for her grief. I will look out for another book by Ms. Didion, but I couldn't shake the feeling that I was witnessing something that was not mine to see. I don’t like to follow the trends. If everyone tells me a book or movie is amazing, I usually want nothing to do with it. Case in point – I just read the Harry Potter books this year. I know, I know, they were great. 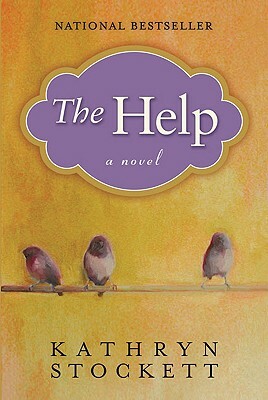 I heard about how wonderful The Help is, from multiple people. I finally gave in and I am glad that I did. This is one of the best books I’ve read this year. Check out my review here. I tend to read more fiction than non-fiction, although I have been known to read a good biography. However, in the interest of full disclosure, I am a little bit of a history nerd and may have won some sort of award my senior year of high school to prove it. I saw this book featured on Goodreads as a giveaway, entered, and won a copy. Hooray for winning free books! 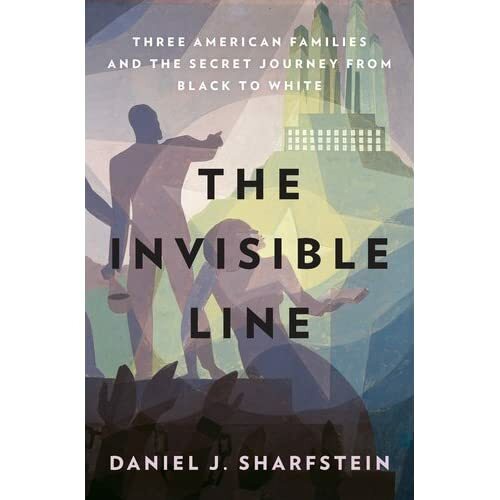 Professor Daniel Sharfstein of Vanderbilt University uses his book The Invisible Line to examine the lives of three families from the mid-1700s through the twentieth century. Each of these families is African-American, but passes themselves off as or is perceived as white at some point during their history. This book starts off slowly, and it took me a while to get into it. It is sometimes confusing to keep track of which family is which, but this is easily remedied by checking the previous chapter or the family trees provided at the beginning. The fascinating conclusion of Professor Sharfstein’s research is that the line between black and white is not as solid as we are taught in US History class. African-Americans fought on both sides during the Civil War. A little girl, despite looking white and having white ancestors back several generations, is expelled from a white elementary school. In several communities, families were as white as they behaved, or as white as their neighbors desired them to be. The color line turns out to be a completely constructed – the same people are sometimes white and sometimes black, dependent on how they portray themselves or how their neighbors want their communities to appear. Many communities, having accepted the families as white for multiple generations, decided that exposing their neighbors was not worth upsetting the status quo. Although this is a non-fiction book and these are historical accounts, Sharfstein writes like a novelist. His meticulous research results in fully-fleshed out characters that the readers come to care about. By focusing on three families throughout several hundred years, the reader gets both a wide view of issues of race and identity and a look at the day to day lives of people in different periods in American history.